Boker's provides custom stamped parts and components to accommodate nearly any aerospace and aviation application. Those applications include avionics, flight control systems, airframes, engines, hydraulic, pneumatic and other aviation equipment that require specific, unique specifications. 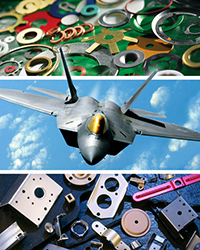 Customized stampings and washers meet the highest quality standards in the aerospace and aircraft industries. Boker’s, Inc. has qualified for the SAE Aerospace Quality Standard AS9100, the highest international measure of quality and safety in the aviation, space and defense industries. Custom washers are available in outside diameters ranging from .080 inches to 12 inches. Boker’s custom stamping offering includes flat blanking and piercings in sizes up to 12" x 12", metal forming in thicknesses from .005" to .190" and draws up to 3" deep and 8" in diameter. Material choices include 2,000 metallic or non-metallic options, low-carbon sheet steel, various super alloys, stainless steel, aluminum, brass, copper and nickel silver. Non-metallic materials include ABS, acetal, polyester, nylon, MD nylon, polycarbonate, fiber, polyethylene and NEMA grade laminates. Boker’s also provides thousands of non-standard washers and spacers that can be manufactured to suit multiple aerospace products with no tooling charges. Combined with a variety of washer and spacer customization options—including size, thickness, metallic and non-metallic materials, and production levels—millions of possibilities are available. Boker’s also provides all the secondary operations to meet the demanding requirements of the aerospace and aircraft industries including deburring, tapping, reaming, counterboring, and spotfacing. Boker’s also has approved vendors for heat treating, plating and non-destructive testing (N.D.I.). To obtain a quote for your custom aerospace stamping or aircraft stamping project fill out Boker’s fast quote form and submit with your production prints.